Great cup holder. Installation is so easy it could probably be done by my dog if I gave her enough time. Sliding the passenger seat forward, it does hit the cup holder. However, the cup holder does swivel left and right, so you can easily move the cup holder out of the way to make sure it doesn't hit the seat. My only real gripe would be the price, but with the other one being around $70 and the fact the stock cup holders are TERRIBLE, this is a great buy. NOTE: This is the version that fits the Generation 1 MINI which is the 02-06 hatchback and the 04-08 Convertible. 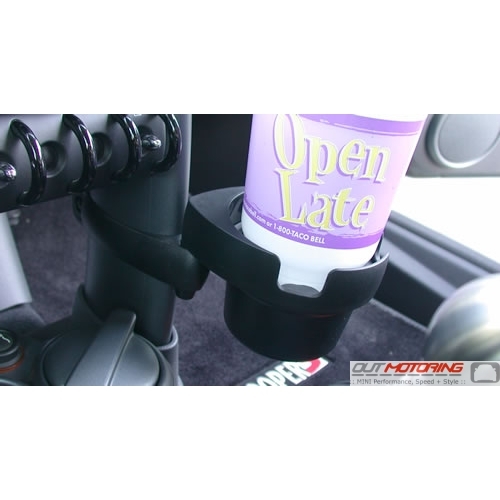 We have a different version of this that fits the newer Generation 2 MINI's as well (MINI Fini Cup Holder: Gen2). One of the most frustrating things about the MINI interior is the fact that there are no places to put a drink. Going above and beyond, MINI sent nearly every MINI buyer a complimentary MINI mug that actually fits in the obscure cup holders/ash tray. While it was a nice gesture, the problem is still there. There are no CUP holders worth anything. Then along comes a company called MINIfini, who has a great solution! It works so well that many of our customers use them to hold cell phones and PDA's etc or buy two and use one on either side of the radio! This MINI Fini design has an injection-molded bracket and cup tray with rubber fingers that hold even the largest of cups. Clean design and perfect fit make for a somewhat expensive product, but it's worth it. Far from the kind of stuff you find at auto parts stores, this is a custom design JUST FOR THE MINI! Very easy install requires a simple screwdriver and maybe 3 minutes of install time.